Different Kinds of Hose Reels- Which Is Best for You? >> The Different Kinds of Hose Reels- Which Is Best for You? The Different Kinds of Hose Reels- Which Is Best for You? Hoses are long and can get in the way if they are left unreeled. Large knots and tangles will develop and people will often trip on them without a good hose reel. That’s why hose reels are so important to have. 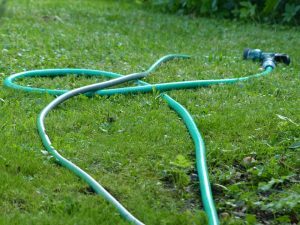 Not only will your yard look a lot better without a tangled mess, it’ll also be safer and your hose will be easier to use. Hose reels are not one size fits all. There are many different kinds of hose reels that you can choose from. Although there are different kinds of hose reels, they all have the same purpose. Their purpose is to keep a hose wound up to prevent damage to the hose, knots, tangles, and tripping. Here are the different kinds of hose reels and which is best for you. Stationary hose reels are exactly what they sound like; stationary. They don’t move and they stay in one spot. Although these hose reels are simple in design, they are fully functional. Most hose reels will have a crank on them that allow you to manually wind the hose back up into the reel. These stationary hose reels can be mounted on a wall, or they can be on the ground. Make sure that your stationary hose reel is exactly where you want it because you won’t be able to move it easily. You’ll have a little more freedom with portable hose reels. These kinds of hose reels usually resemble a dolly. Portable hose reels have wheels and a handle that you can push around. It’ll still have a hand crank that will allow you to easily wind the hose back up when you need to. The portable nature of the hose reel will help you get the hose from one spot to the next really easily. Instead of dragging the unwound hose up, just wheel the entire reel over. This is the right hose reel for you if you have a large yard with multiple things that need to be watered. You’ll need a hose reel that can move to reach all your plants. 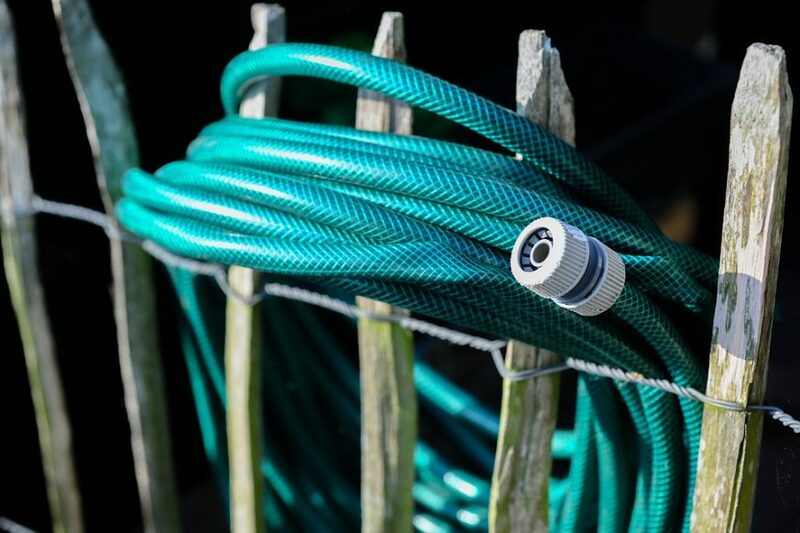 Hideaway hose reels are great for people that like garden tools and supplies to be hidden. Typically, hideaway hose reels are mounted to the wall so that the hose can be completely hidden from view. The hideaway box can be simple or decorative depending on your taste. Usually, hideaway hose reels will have a detachable hand crank that can be removed. This is to better hide the appearance of a hose reel. Similarly, hose reel carts can move around like portable hose reels. They also have wheels. In contrast, hose reel carts are more like tables with the wound up hose underneath. The cart will also have drawers where nozzles or other tools can be stored. This is a great choice for people that love extra storage and need a lot of room for their tools. Hose reel carts will have plenty of space for whatever you need to put in it. A decorative hose reel is perfect for the person that loves the look of things rather than functionality. 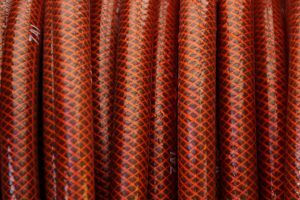 Typically, decorative hose reels are made for lighter duty hoses and aren’t meant for heavy use. They are meant to look pretty in your yard and they do a great job at it. There are all sorts of different styles and looks of decorative hoses. A wooden decorative hose makes for a rustic feel, while a fancy iron one will look more modern. These decorative hose reels will vary greatly in price depending on which look you go for. Don’t want to have to crank up the hose every time you use it? This is the hose reel for you. A spring loaded hose reel will do all the work for you. The hose will be retracted for you instead of you having to crank it by hand. A button or a lever will need to be pushed and the hose will be retracted. This saves time and energy, but it will cost more. The spring loaded retraction system will increase the price of the hose reel quickly. However, if automatic retraction is important to you then it might be worth the money. This is specifically for air hoses. Air hose reels can be mounted, portable, or stationary. Start taking a better look at gas stations or tire shops and you’ll see some air hose reels. Some people like to have air hoses in their garage or work space. Air hoses are great for pumping up tires or using an air compressor. They make work in workshops a whole lot easier. Consider getting an air hose reel if you have an air compressor or something similar. Want to Go the DIY Route? Another way to go is the DIY route. There are a lot of DIY hose reel ideas out there. You don’t have to buy one in the store at all. Here are just a couple of easy ideas to make your own hose reel. Wind your hose up inside an old tire. Easy peesy! You can decorate or paint the tire to look cute and match your style. The best part is that it’s really cheap to make. This can be a stationary or portable hose reel. Leave the old tire in the same place every time and it’s stationary. Roll the tire to where you need it to be and it’s portable. Whichever you prefer. Grab an old, metal bucket and mount it to a wall. Then wrap your hose around it on the wall. This is easy, cheap, and cute. It’s also good because you can put things inside the bucket on the wall. Put some work gloves inside the bucket. Or maybe even some other work tools. An old wood spool makes the perfect DIY hose reel. It’s already the perfect shape to wrap your hose around. Mount the spool on your wall or leave it on the ground. It looks cute either way. Roll the spool anywhere that you need your hose. Hose reels make using your hose a whole lot easier. They protect your hose from getting damaged, all while making your hose easy to use. You won’t be tripping on your hose anymore when you have a hose reel. Take a look at the different kinds of hose reels and see which one is best for you. Do you want the cheapest option? Is functionality important to you? Would you want something with a great design? Whatever you like, there is a hose reel for you.